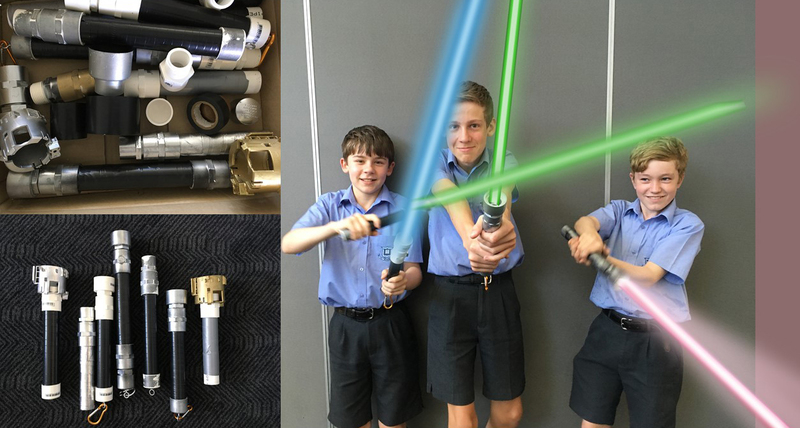 The Lunchbox Club boys have been “constructing their own lightsabres” (sorry Darth!) and finding fun ways to repurpose used plastic printer cartridge components, PVC, and other typical components you would usually find lying around in a junk shop on Tatooine. We’ve also just made a deal that will keep the Empire out of here forever and are always happy to have new members! Nobody is too short to be a stormtrooper. We will never tell you the odds. You won’t have a bad feeling about this. You’ll find we’re full of surprises. We may be the droids you’re looking for! So, unless you would prefer another military target…or wish to be a scruffy looking Nerf herder…then JOIN US, because this ‘aint like dusting crops’ boys! Our Lunchbox Club is a space that provides a balance of hands-on and minds-on activities for boys eager to explore a range of technologies and creative interests. The Club provides a makerspace, always with a focus on STEAM activities aimed at supporting curriculum learning while enhancing students’ digital skills portfolios from early on. Recently, the boys have focused on exploring fun ways to recycle and repurpose waste materials. 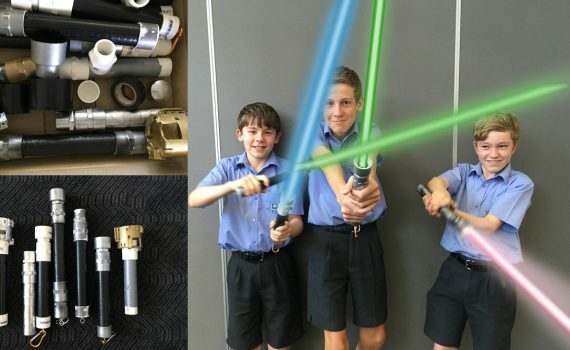 Technological waste and plastic components have been given new life as the boys fashioned these unwanted leftovers into lightsabres. The project has been so successful we are now running Prop Shop activities as part of regular Lunchbox Club activities.